News and views for Sand Key residents and visitors. Where on earth is Sand Key? Sand Key is a tropical enclave nestled between Clearwater Beach and Belleair Beach Florida, flanked on one side by the Gulf of Mexico and the Intracoastal Waterway on the other. A legal hurdle has been cleared for the redevelopment of the Cabana Club on Sand Key. The 6th Judicial Court denied an appeal by five petitioners who questioned an earlier ruling on parking and traffic requirements. The Cabana Club restaurant, which closed last year, will be replaced with a 6 floor boutique hotel. 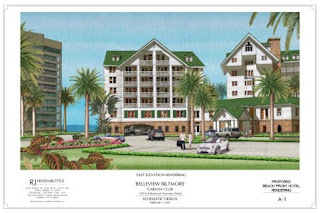 The redevelopment was approved the the Community Development Board in 2008 and as part of the $100 million 3 year renovation of the historic Belleview Biltmore in Belleair. The Cabana Club will serve as the Biltmore's "beach club". The following condo buildings allow pets.